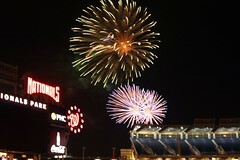 The weather on Thursday night was about as perfect as you can find in June in Washington, a great night at the ballpark. The Nats were looking to complete the sweep against the Pirates, hoping for their first of the season. Zach Duke stood in their way, 2009 All-Star, and starting pitcher for the Pirates. No, he’s not Stephen Strasburg, but ¡Livan! Hernandez is the Nats’ current #1, and he was on to devour some innings tonight to finish the homestand. Duke and Hernandez pitched strong games through three, with each team getting just a runner here and a runner there before the Nationals figured out Duke in the fourth. Adam Dunn sent the sixth pitch of the at-bat about four rows deep into the second deck in right field, and Willingham would take it left, depositing the ball into the Red Porch’s second row, making it 2-0. The Pirates would get to Hernandez in the sixth inning, with Duke and Tabata doubling to start the inning, and Walker singling Tabata over to third. He would come on a sacrifice fly to Morse shortly thereafter. Livan would fight back, delivering what Riggleman called some of his best fastballs of the night and keep the damage to just a pair. If there was one inning emblematic of the Nationals’ offensive troubles, it was the sixth. Pudge drew a lead-off walk, followed by a pair of singles from Morse and Bernadina to knock out Zach Duke. Willy Harris, pinch-hitting for Alberto Gonzales, in turn pinch hitting for Livan Hernandez, would line out to the second baseman Walker, who’d flip to shortstop Bobby Crosby to double up the errant Morse and reduce the threat significantly. Guzman would ground out to end the inning and erase the scoring threat without a single run. You can’t expect to do much as a ballclub if you can’t capitalize on situations like that one. Riggleman was cool about the sixth in the postgame press conference, but called Morse’s baserunning just a little blip in an otherwise excellent night. Morse would fire up the telegraph in the eighth inning to deliver a much-needed insurance run for the Nationals with a 410-foot shot to deep center, making it 4-2, and allowing some room for tonight’s closer, Tyler Clippard. Clipp didn’t need it as he acted as Save tonight, and retired the Pirates quickly to deliver the Bang and Zoom for Charlie Slowes’ fireworks, also securing the win for Livan. The Nats are on a quick two-series road trip against Cleveland and Detroit before returning next weekend to face the White Sox, and then the Royals. Former Nationals Closer Joel Hanrahan pitched the seventh tonight and retired the heart of the order, including strikeouts against Zimmerman and Willingham. Nyjer Morgan enjoyed a night off from Center Field, but would pinch hit and enter the game in the 9th inning. Capps was also off tonight, having pitched in three straight ballgames. The three slot is fairly kind to Adam Dunn, where he’s 9-for-21 (.429), but that may be due to his only starting there against lefties. The Indians have reportedly sold close to 10,000 tickets for Sunday’s Strasburg start in the last three days.